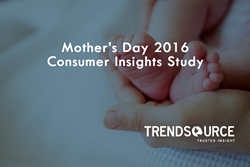 TrendSource Trusted Insight, a market research and strategic consulting company, conducted their 4th annual Mother’s Day Shopper Insights Study to identify consumer buying intentions for the holiday. This year’s Mother’s Day Consumer Insights Study revealed that nearly 80% of those shopping for Mother’s Day intend to spend $100 or less, around the same as they did in 2015. However, there appears to be a true disconnect between what mothers desire for Mother's Day and what consumers intend to give as gifts. Most noteworthy, 53% of mothers desire spa gifts, yet only 20% of respondents plan to give this as a gift despite the fact that many spa gifts and packages are within the budgetary confines of the respondents (under $100). Additionally, while flowers and greeting cards are "go-to" gift items for Mother's Day, the results show that these are not the most-desired gifts for the holiday. TrendSource Trusted Insight surveyed North American MSI Field Agents between February 26th and March 13th, 2016. Results represent 1,889 online respondents. All respondents opted in to respond voluntarily. TrendSource Trusted Insight is a market research and strategic consulting firm specializing in customer experience management, consumer insights measurement and compliance solutions. We create clarity in the world of business through Trusted Insight that delivers measurable ROI. With over twenty-five years of experience, TrendSource’s customized solutions deliver highly efficient Customer Experience Programs that quantify service gaps, provide prescriptive/corrective solutions, identify trends, and provide actionable solutions through enhanced reporting and analysis.